The latest and greatest release of iOS 10 is here, and with the public release just around the corner it’s a good time to start preparing your iPhone and iPad hardware to install the iOS 10 update. 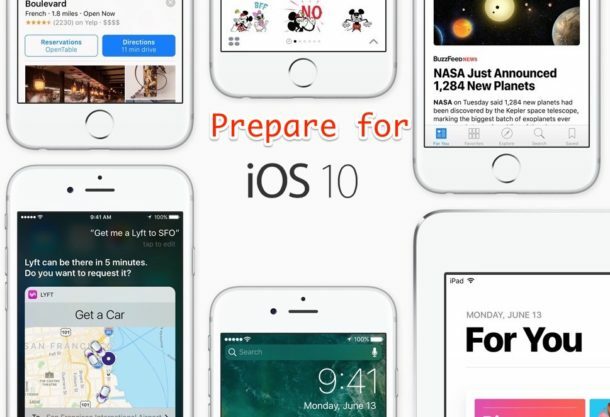 Let’s walk through some important steps to prepare for the iOS 10 update the right way, including checking for supported hardware, doing a little cleanup, insuring adequate backups have been made, and then of course, diving right into the install. Obviously if the device doesn’t support it, there won’t be any updating, so does your iPhone or iPad support iOS 10? Chances are good that it does, and if the iPhone is a 5 or newer, or the iPad is an Air or Mini 2 or newer, it will be supported. Only the newest model iPod touch is supported, however. 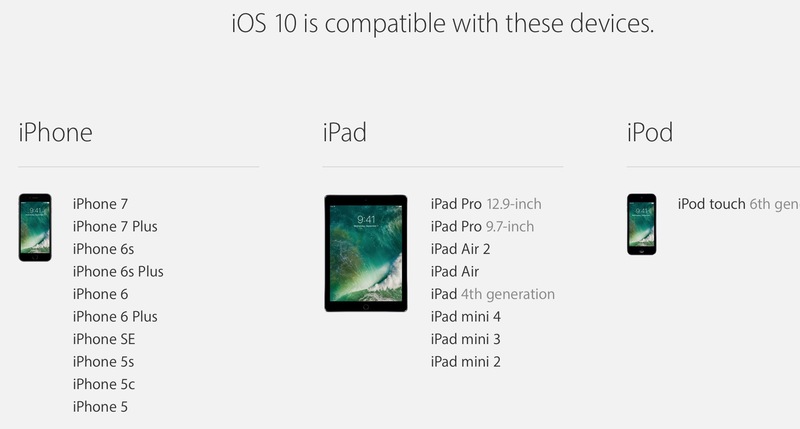 You can see the full iOS 10 compatibility device list here. It’s always a good idea to clean house and trash any long lingering ancient apps before installing a new iOS software release onto any iPhone or iPad. Uninstall apps that are old and stale that are hanging around on the device that aren’t getting any use. If you haven’t used it in months and don’t think you need it, delete it, you can always re-download them again later if you change your mind. If you’re like me, you have a dozen or more app updates that are sitting as the big red notifier button the App Store icon. It’s easy to slack off on installing app updates, but when a big software release is available it’s finally time to dust of the App Store and get those updates going. Don’t forget visiting the App Store Updates tab to install updates for the apps which are remaining. Many apps are updated to support the latest and greatest releases of iOS system software, so don’t skip out. 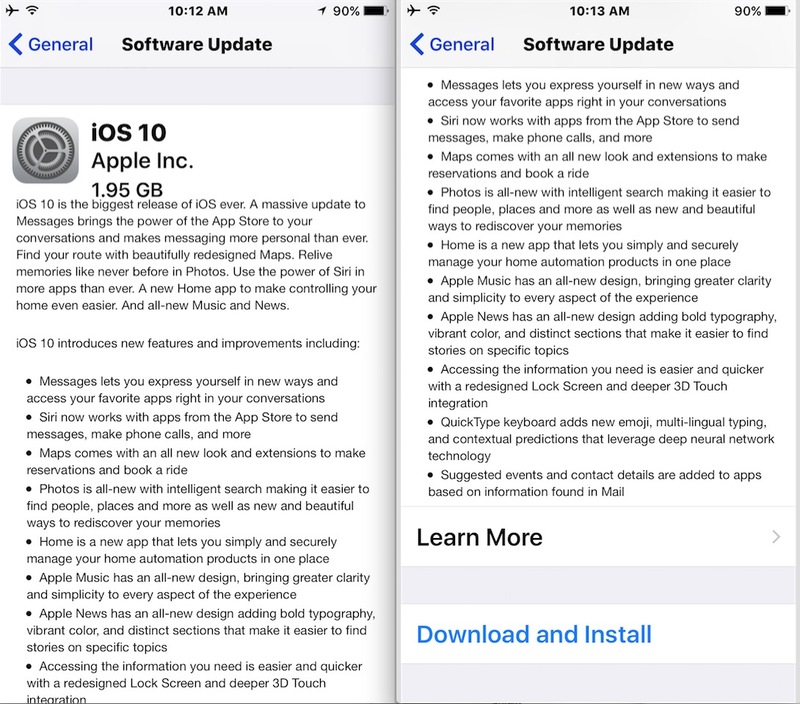 The iOS 10 download is around 2 GB and requires some additional space to install, so aim to have about 2.5 GB or more free when downloading and installing the update. No that does not mean it will take up that much space when it’s finished, it just needs to room to download, install, and process the update, and much of that space will be available again once it has completed updating. The aforementioned process of removing ancient apps will likely free up some space, but if you have a lot of videos and pictures on the device you might want to copy the pictures from the iPhone or iPad into Photos app on Mac or you can use Image Capture on Mac or transfer them to a Windows PC too. Media is often the biggest storage hog on a device, so if you’re really tight on space consider your image and movie library. Still need more storage space on the iPhone or iPad? Check these additional tips to free up storage space in iOS. This is arguably the most important thing to do. You probably already backup the iPhone or iPad regularly, right? If not, you should. And you absolutely need to backup the device before installing any software update, particularly for the big release updates. Do not skip this, it is critical. 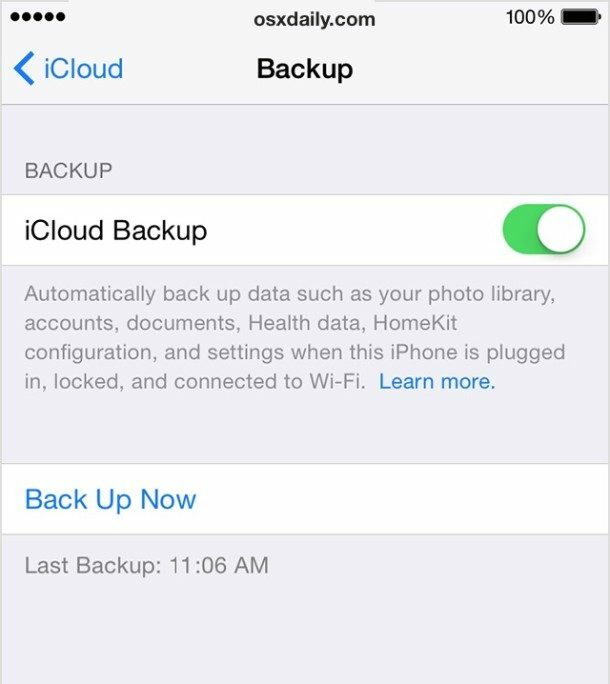 The easiest way to backup any iPhone or iPad is with iCloud, which can be done from the Settings app > iCloud section. You can also backup to a computer with iTunes. If you want to be extra safe, backup to both. If you’ve never done this before, you can learn how to back up an iOS device here, covering both iTunes and iCloud. If you skip backups and if something goes haywire, you may lose all of your data. That’s about as catastrophic as it can get, and nobody wants to lose personal data, pictures, notes, and everything else that matters which is stored on an iPhone or iPad, so do not skip backups. It’s minimal effort for a lot of peace of mind and data security. Now you’re ready to install iOS 10! The iOS 10 release date is September 13, so you’d want to be cleaned up and backed up by Tuesday if you want to install on day one. The update will be made available in the Settings > General > Software Update section of iOS, and you can also install iOS 10 through iTunes by connecting an iPhone or iPad to a computer. It’s worth mentioning that for the incredibly impatient, they don’t have to wait. It turns out that anyone can download and install iOS 10 GM right now by enrolling in the public beta program, but for most users it’s a better bet to just wait until the official release on September 13. Enrolling in the public beta program means the device will get future beta updates as well, which is usually not desired by an average user. 7: Or…. Should You Wait? Do you really need to update to iOS 10? That’s entirely up to you to decide. If your iPhone or iPad works great the way it is right now, you could always put off the update, or even avoid it all together. But by skipping iOS 10, you’d obviously miss out on major new features, built-in security enhancements, and any bug fixes included in the release. Another approach is to wait a little bit. Some users like to wait to install major iOS software updates until there the first point release or bug fix update is made available. That could mean a small point release, maybe arriving as iOS 10.1 or iOS 10.0.2 or something similar, which typically arrives a few months after the major initial build. This approach is really for people who like to be extra cautious and let any theoretical major bugs or potential problems that slipped through the beta periods get sorted out before they jump in themselves. There’s nothing wrong with the cautious approach, it’s just a matter of preference as to whether or not this suits you, your hardware, and your use case. Do you have any tips for preparing for a major software update? Are you diving into iOS 10? Did we miss anything? Let us know in the comments! I installed iOS 10 already, it’s interesting. It’s one of those releases that will be best when all of your friends and family have iOS 10 as well so that Messages features are usable together. I do wonder how the general public will respond to the lock screen changes, which to me are very unintuitive and I have been using iOS 10 for weeks. We are habituated into slide-to-unlock and now there is no slide-to-unlock. That will take some getting used to. The Photos Face recognition and people album is a little…. intrusive…. well I don’t know if everyone is going to want that or be happy about it. There is no way to turn it off too, which makes it a little more…. invasive? I don’t know, I think the privacy implications will bother some people. I also think it’s slower than iOS 9, but I swear every iOS release is slower than it’s predecessor so that is par for the course. I bet it will run great on iPhone 7 though, and mine is coming on release day so that is exciting. Replacing slide-to-unlock is a press of the Home button. With Touch ID it is a long press which ends up triggering Siri sometimes instead. It feels like a beta lock screen and it is not as intuitive as slide-to-unlock. There should be an option to get slide-to-unlock back in iOS 10, I have looked in the settings and found nothing. If we don’t recall, How do we know what iPad mini we have? Shriely, to identify your iPad Mini model number you have to turn the device over and look at the model number on the back. It’s small print and cryptic like A1489, A1490, A1491, A1599, A1600, A1538 , A1550 etc, those models of iPad Mini support iOS 10. 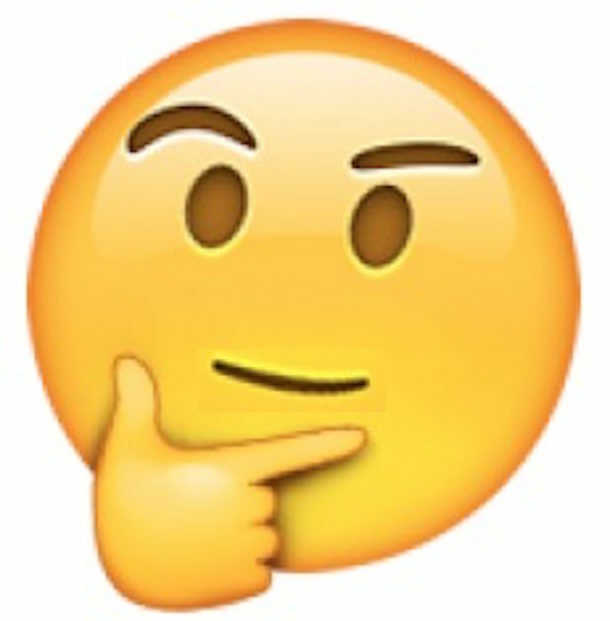 So you take the model number and determine what model it is and then you compare it to the list of supported iOS 10 devices. Obviously this is a bit overly complicated endeavor in my opinion as the average user should just be able to look at the name to determine the model: iPad Mini, iPad Mini 2, iPad Mini 3, etc. Settings>General> and check the model number. Google ipad mini (model number) and it should tell which mini you have. You forgot to mention one important step: Prepare your wallet! Chances are, you’ll find iOS 10 slower than anything else. Of course you can’t go back, so your only option is to prepare your wallet and buy the LATEST gizmo. How will it be for those with iPad-2 and iPad3 from now on updates? There are no more updates for those iPads. It’s too bad because they are still usable, but will be open to security flaws. It’s Apple’s way of saying, upgrade now fool or be left in the dark. Why do we need a new way to unlock and a slower iOS screw Apple my less than 4 year old iPad mini is about to be essentially worthless because its unsupported bt 10. Over half a grand it cost and now this don’t be sheep Apple gets no more of my money!!! NEVER install the first version of anything. Apple lets the public “beta test” their new software by releasing to the public. I wait until at least the second major release and research from users before I do ANY updates to ANY Apple OSX or iOS. True! !, I will never install the first upgrade of anything!, my IPad 3 became a brick after the latest update, ( this is the 2nd time in less then one year), so now I have hours of investigation to fix my still good IPad 3, for now I have about 10 hrs of investigation without positive results. If the iPad is unusable you should perform a DFU restore to get it usable again. It will erase everything on the device but perform the lowest level hardware restore possible. My have an iPad 3 that still works great but I have avoided software updates on it for years now, after I updated one time it got so slow I figured well don’t do that again. I only use it for reading and basic web browsing on prominent trusted sites so I do not worry about the missing features or patches. dp, the very first step discusses checking compatibility with the iPhone model. You can install iOS 10 on any compatible iPhone. I suggest you read the article. You had to skip over the entire article to get to the comments, so what you need to do is scroll back up to the big “1: Check for Device Compatibility” heading section and read that. There is even an enormous graphic under “1” to show you what iPhone models are compatible with iOS 10. If you have any compatible iPhone, you can update that iPhone. Just match up your iPhone to the graphic or click the link for supported iPhone models and read that to find what devices support iOS 10. Personally I like to jump onto the first iOS update to get the new features but I usually feel that performance and reliability is better after the first update release. I updated to iOS 10 already, but it will inevitably be better at iOS 10.1 and iOS 10.2 etc. I’m waiting for the next release update. I’ve had problems w/ both 8.0 and 9.0 releases. So when 10.1 or 10.0.2 or whatever comes out, I’ll update. Since I only have 1.35 GB free, will delete all my music to do the update and reinstall (got my iPhone 6, 16GB for a bargain price new). BTW, it did not seem to slow down my 5s at all. Perhaps because I have a fair amount of free storage space? I don’t have any music loaded on it, very few pictures (it’s a work phone). But I do have some hoggy apps like the MS Word and PPT. It all seems to be the same speed as with iOS 9. Hey can anyone suggest how to install the stable version tomorrow if I have the iOS 10 gm already installed ? Will it come as an ota or am i supposed to delete the beta profile and check for an update because even after deleting the beta profile the stable update doesn’t show up .. kindly suggest thanks in advance. iOS 10 GM should be exactly the same as iOS 10 that will be released tomorrow, that’s why it’s called GM. If you want to reset the device as new and delete the beta profile or use iOS 10 IPSW you could to that but it’s supposed to be the same version. Best to hold to off on installing ANY new OS on a critical device. Experience tells me this. Everything is speedy on my iPhone 5S. I’ve gotten used to the no-slide-to-unlock and the way the controls work. It’s just that Face Recognition in photos. Quite comprehensive introduction about iOS 10 update. I agree that iPhone uses should back up their iPhone system or their important data before the upgrade for Apple is not that reliable LOL. I always backup my iPhone with iTunes or iCloud. Another software recommended is MacX MediaTrans for its fast speed. RATS!!! I really HATE the new unlock “feature” it take 3x longer to unlock my phone now!!! I agree with the folks that don’t like the unlock feature cause I go into SIRI instead many times. Had to put my “touch” feature. When that works I’m in quickly. Sometimes I don’t even want on but there I am.